When I got up this morning, I was really stiff and my hand wasn't quite moving like it normally does. That's why I left for the studio early and got about three hours of practice in before the match. This got rid of the stiffness and allowed me to play good games. If you were to evaluate today's match? I was sure I would win 3:0 so I regret dropping a set out of arrogance. I thought I had the first set in the bag so losing it hit me hard. So did dropping the first set despite getting ahead affect the later sets? I figured out Leenock's style so it was a breeze. You tried proxy rax bunker rush several times so was there a particular reason? The bunkering was to ensure that Leenock would not be able to take his gases quickly. This means that there is no opportunity for Mutalisk play and I am free to do what I want. That's why I focused so hard on early aggression. Do you have regrets about losing to Rain in Ro16? Rain had great warp prism harass in his game against Byun. I don't normally watch a lot of VODs so I hadn't quite figured out his style. I think that's why I lost. Who do you want to face in Ro4? I don't care. They are both great players so it's hard to predict who will advance anyway. 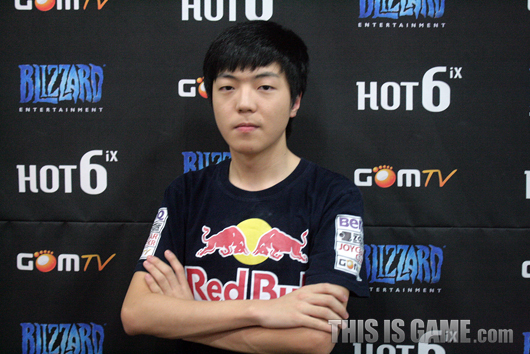 It's great to have a Starcraft 1 progamer join our team. I'm sure he has a lot to teach me with his wealth of experience. Lately, there has been talk that Infestor/Broodlord is an unbeatable combination so what do you think? Unless it's a map like Metropolis, that is indeed true. On Metropolis, you can skimp out on your ground forces while producing Ravens but on other maps, that is simply impossible. As you produce ground forces to contend with the Zerg, you fail to make enough Ravens to stop the Broodlords. As mentioned before, Sea recently joined our team so I hope we get along well. I want to thank our sponsors Twitch TV, Razer, theLittleAppFactory as well as my family at home and the fans who cheer me on. I thought I would win 3:0 but was caught off-guard by an unexpected strategy in the first set. I'm worried because now I have to go back to school and won't get to practise much. I almost never lost in practice and lately, I've been doing well in actual games. How was today's match for you then? When were you certain that you would advance to Ro4? I think the turning point was in Set 2 where I saved my Zerglings against Hellion harass. It's definitely been helpful. Before, I used to play the game as a hobby but since joining Startale, the coach got me to practise in a structured manner and that's definitely made a differencel. Zerglings have great mobility and are fantastic units in the right hands. I want to make it my trademark unit. MKP is a player prone to mental breakdowns so that was intentional. Set 4 was proof to me that it had worked. Zerglings will beat Hellions any day as long as they close the distance. That's why I was very aggressive with my units. 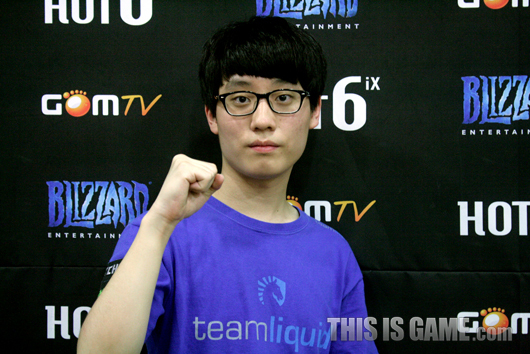 You face Taeja in Ro4 so how confident are you? I am a bit worried but with enough practice, a win is possible. I saw his Ro8 match prior to my own and seriously, Leenock didn't play poorly at all and it was more Taeja having superior strategies. I think I need to be on my toes. Do you want to try taking down the unstoppable Rain in the finals? Sure, if he makes it that far. I want to say thank you to my school teacher who excused me so that I could practise and also Sculp, Sting and the Startale Terrans. I want to thank the sponsors Red Bull, BenQ, Zowie and Joy Gear as well as all the fans who came to cheer me on. You kept your word to spread chaos, haha. Very fast, thanks! Also lol, this confirms Sea joining definitely. TaeJa makes his interviews short, wanting to practice some more. The road isn't always straight. Is the Liquid announcement still being written? So quick with translations - thanks storywriter! TaeJa dropping the certainty bomb on Sea? That makes me soo happy. Awesome pick by Nazgul. Woah that speed! Thanks storywriter. The Team 8 player? He left team 8? EDIT : TL dropping the ball then. Better make an announcement right away.